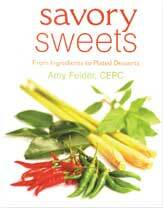 In her own words, Ms. Amy Felder describes her new approach to baking as a, “type of fusion cuisine.” She has done just that in her newest book Savory Sweets: From Ingredients to Plated Desserts in which ingredients once restricted to the “savory world” have combined with their counterparts in the “sweet world.” Ms. Felder is a certified Executive Pastry Chef and an Associate Professor at Johnson & Wales Culinary Institute. Examples of the masterfully created desserts found within are brought to light by photographer Jerry Lanuzza. Mr. Lanuzza is also an Associate Professor at Johnson & Wales in Charlotte, North Carolina. This textbook is broken into four basic parts: Vocabulary of Flavor, Mechanics of Flavor, Constituents of Flavor and Works of Flavor. It is in the final section where the recipes are located. However, I would not dismiss the Appendix at all. Just by casually thumbing through it I recognized immediately that it is a concise, quick-reference guide for a plethora of sauces, doughs and other base- flavorings. The Roasted Pineapple is part of a larger recipe. I do believe though it could stand on its own due to the fact pineapple is cooked in the oven and seasoned with Chinese five-spice powder and sake. As this book is all about fusion, it was inevitable that chocolate and beets would meet. In this case they combine to make the Beet Chocolate Cake which requires the beets to be roasted. If you really want spicy and sugary sweet at the same time, may I suggest the Strawberry Salsa. By spicy I mean jalapeño peppers mixed with sweet strawberries with a sprinkle of tequila gold.